CBI - China: Day 149 of 154 of the Japanese Invasion of Manchuria. CBI - China: Day 17 of 41 of the 1st Battle of Shanghai. CBI - China: Day 44 of 142 of the 1st Battle of Hebei. Spain: Day 212 of 985 of the Spanish Civil War. Spain: Day 577 of 985 of the Spanish Civil War. CBI - China: Day 222 of 2,987 of the 2nd Sino-Japanese War. Day 7 of 124 of the Battle of Henan. Spain: Day 942 of 985 of the Spanish Civil War. CBI - China: Day 587 of 2,987 of the 2nd Sino-Japanese War. Finland: Day 76 of 105 of the Russo-Finnish War. Soviet troops capture the forts on Karelia Isthmus. CBI - China: Day 952 of 2,987 of the 2nd Sino-Japanese War. Day 91 of 381 of the Battle of South Guangxi. Day 17 of 67 of the Battle of Wuyuan. ETO - UK: Day 161 of 258 of the Blitz. East Africa: Day 249 of 537 of Italy's East African campaign in the lands south of Egypt. East Africa - Eritrea: Day 9 of 56 of the Battle of Keren. CBI - China: Day 1,318 of 2,987 of the 2nd Sino-Japanese War. Day 15 of 31 of the Battle of South Henan. CBI - Thailand: Day 136 of 221 of the Franco-Thai War (Vichy France vs Thailand). Atlantic: Day 31 of 169 of Germany's Second "Happy Time," during which U-boats sink 609 Allied ships with little risk. Day 3 of 3 of the German Channel Dash (Operation CERBERUS). The German Fleet safely enters the Baltic Sea. ETO - Norway: Vidkun Quisling, the puppet ruler of Norway, visits Berlin. Russian Front - North: Day 159 of 872 of the Siege of Leningrad. Russian Front - North: Day 6 of 102 of the Battle of the Demyansk Pocket, another failed attempt to break the siege at Leningrad. Russian Front - North: Day 22 of 103 of the Battle of the Kholm Pocket. Another attempt to break the siege at Leningrad. Russian Front - Center: Day 37 of 103 of the Battle of Vyazma, Russia. The Soviets advance into White Russia (Belarus), but meet strong resistance by German Army Group Centre. Russian Front - Center: Day 37 of 103 of the Battle of Sychevsk, Russia. Russian Front - South: Day 107 of 248 of the Siege of Sevastopol, Crimean Peninsula. All German attacks against Sevastopol are stopped for the winter. CBI - Burma: Day 62 of 164 of Japan's Invasion of Burma. CBI - China: Day 1,683 of 2,987 of the 2nd Sino-Japanese War. Day 52 of 99 of the 3rd Battle of Changsha. CBI - Indonesia: Day 1 of 3 of the Battle of Palembang, Sumatra. Japanese will defeat the Allies. CBI - Java: Day 15 of 17 of the Battle of Singapore. PTO - Borneo: Day 60 of 107 of the Battle of Borneo. PTO - Philippines: Day 68 of 152 of the 1st Battle of the Philippines. 5th Air Force provides air support. USA: The Marine Corps Women's Reserve (WR) is formed. Recruitment posters proclaim "Free a Marine to Fight." More than 22,000 women will do just that. 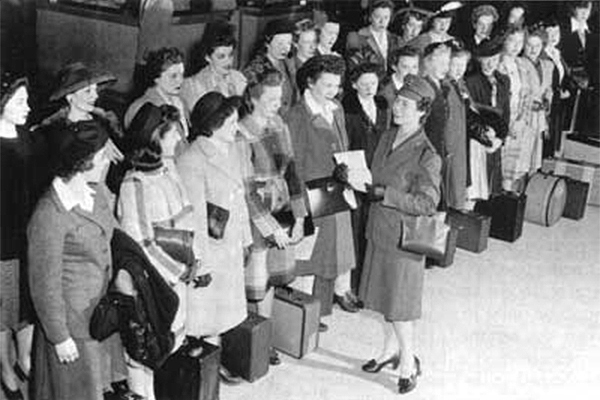 The first WR recruits to be shipped to New York for training at Hunter College receive instructions from 1st Lt Helen Perrell at Philadelphia's 30th Street Station. 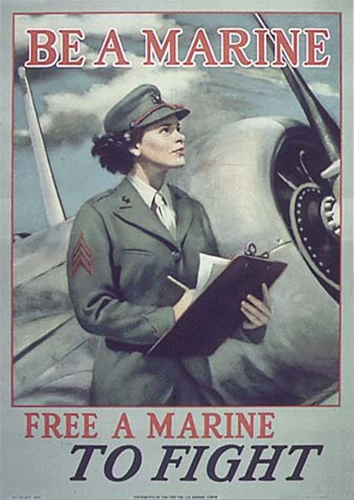 Marine Corps Women's Reserve recruitment poster proclaiming "Free a Marine to Fight!" ETO - UK: US 8th Air Force: Flying Spitfires, the 4th Fighter Group flies shipping patrols. Russian Front - North: Day 524 of 872 of the Siege of Leningrad. Russian Front - North: Day 4 of 51 of the USSR's Operation POLAR STAR, a failed offensive north of Leningrad, hoping to take the southern shore of Lake Ladoga, Russia. Russian Front - North: Day 4 of 4 of the Battle of Krasny Bor. Soviets back off as they fail to recapture this strategically important town near Leningrad. Russian Front - North: Day 285 of 658 of the Siege of the Kholm Pocket, USSR lays siege to the Kholm Pocket but the Germans hold out for a about a year and a half. Russian Front - South: Day 64 of 69 of the USSR's Operation LITTLE SATURN. A successful drive into the Northern Caucasus and the Donets Basin pushing the Axis troops out. MTO - Greece: US 9th Air Force RAF Liberators attack Heraklion Airfield in Crete during the late afternoon and early evening. MTO - Italy: US 9th Air Force B-24s bomb the Naples area and Crotone Airfield under serious storm conditions. MTO - Tunisia: Day 89 of 178 of the Battle of Tunisia. RAF and US Air Forces provide Allied air support. CBI - Burma: Day 55 of 104 of the 1st Battle of Arakan. US 10th Air Force provides air support. CBI - Burma: Day 6 of 79 of the Allied Operation LONGCLOTH. CBI - China: Day 2,048 of 2,987 of the 2nd Sino-Japanese War. PTO - Alaska: Day 252 of 435 of the Battle of Kiska, Aleutian Islands. US 11th Air Force strafes Kiska targets including the Camp area, landing strip and shipping. PTO - New Guinea: US 5th Air Force attacks targets at Rabaul on New Britain Island. PTO - Solomon Islands: US 13th Air Force attacks shipping near Shortland Island, Buin, and in the Bougainville area. Russian Front - North: Day 650 of 658 of the Siege of the Kholm Pocket. USSR lays siege to the Kholm Pocket but the Germans hold out for a about a year and a half. Russian Front - North: Day 31 of 48 of the Battle toward the Narva River, Estonia. This drive helped lift the Leningrad siege and goes on to liberate Narva. Russian Front - North: Day 12 of 191 of the Battle of the Narva Isthmus, Estonia. Russian Front - North: Day 31 of 33 of the Battle of Luga, Russia. Taking this town west of Leningrad will open the door toward Estonia. Russian Front - South: Day 52 of 113 of the USSR's Dnieper-Carpathian Offensive in southwestern Ukraine. Russian Front - South: Day 15 of 31 of the Battle of Nikopol, Ukraine. Russian Front - South: Day 21 of 25 of the Battle of the Korsun Bulge in Ukraine. MTO - Italy: Day 28 of 123 of the Battle of Monte Cassino. The Allies stop the German counter-attack. The Italians in the monastery are warned that it will be bombed. RAF and US Air Forces provides air support for the Allied ground troops. MTO - Italy: Day 23 of 136 of the Battle of Anzio. RAF and US Air Forces provides air support for the Allied ground troops. CBI: US 14th Air Force attack targets in French Indochina and China. CBI - Burma: Day 46 of 99 of the 2nd Battle of Arakan. CBI - Burma: Day 9 of 19 of the Battle of the Admin Box. Another British counter-offensive begins in Arakan. US 10th Air Force provides air support. CBI - China: Day 2,413 of 2,987 of the 2nd Sino-Japanese War. PTO - New Guinea: Day 148 of 219 of the Battle of Shaggy Ridge. 5th Air Force provides air support. PTO - New Guinea: Day 145 of 162 of the Battle of the Huon Peninsula. 5th Air Force provides air support. PTO - New Guinea: Day 61 of 597 of the Battle of New Britain. US 13th Air Force provides air support. PTO - Solomon Islands: Day 105 of 295 of the Battle of the Bougainville Islands. US 13th Air Force provides air support. ETO - France: Day 197 of 284 of the Battle of Brittany. ETO - France: Day 152 of 236 of the Siege of Dunkirk. ETO - Germany: Day 6 of 16 of Operation GRENADE, the US drive into Germany. US 9th Air Force provides air support. ETO - Germany: Day 6 of 17 of Operation VERITABLE, the British and Canadian drive into Germany. ETO: Day 25 of 66 of the Battle to the Rhine. US 9th Air Force provides air support. Russian Front - Finland: Day 152 of 223 of the Lapland War. Finland and Russia have joined forces to kick the Germans out of Finland's most northern province. Russian Front - Center: Day 122 of 206 of the Battle of the Courland Pocket in Latvia. Russian Front - Center: Day 20 of 75 of the Battle of Königsberg, East Prussia (now Kaliningrad, Russia). Russian Front - Center: Day 19 of 63 of the Battle of the Heiligenbeil Pocket in East Prussia. Russian Front - Center: Day 4 of 54 of the Battle of East Pomerania, Germany. The Soviets capture Schneidemül. Russian Front - Center: Day 6 of 17 of the USSR's Lower Silesian Offensive (Poland). Russian Front - Center: Day 1 of 83 of the German Siege of Breslau (today Wroclaw, Poland). These Germans hold until the end of the war. Russian Front - Center: Day 13 of 31 of the Battle of Schwedt, Germany. Russian Front - South: Day 108 of 108 of the Battle of Budapest, Hungary. The Axis troops finally surrender to the Soviets. MTO: US 15th Air Force B-17s and B-24s hit targets in Austria, Hungary, and Yugoslavia. CBI - Burma: Day 26 of 61 of the Battles of Meiktila and Mandalay. The US 10th Air Force provides air support. CBI - Burma: Day 24 of 39 of the Battle of Ramree Island. The US 10th Air Force provides air support. CBI - Burma: Day 10 of 99 of the Battle of Pakokku and Irrawaddy River operations in central Burma. The US 10th Air Force provides air support. CBI - China: Day 2,779 of 2,987 of the 2nd Sino-Japanese War. US 14th Air Force attacks a number of targets throughout China. PTO - New Guinea: Day 414 of 597 of the Battle of New Britain. PTO - New Guinea: Day 298 of 481 of the Battle of Western New Guinea. PTO - Philippines: Day 117 of 299 of the 2nd Battle of the Philippines, aka the Liberation of the Philippines or the Philippines Campaign. PTO - Philippines: Day 61 of 244 of the Battle of Luzon. 5th Air Force provides air support. US troops capture the last Japanese held naval base and airfield on Luzon. PTO - Philippines: Day 14 of 22 of the Battle of the Bataan Peninsula. 5th Air Force provides air support. PTO - Philippines: Day 11 of 29 of the Battle of Manila. 1943: The Marine Corps Women's Reserve is formed; 22,000 will join to "Free a Marine to Fight"